Erik is responsible for the leadership and direction of Jefferson Land Trust’s stewardship program. He works directly with landowners, volunteers, and other partners to monitor, protect, and restore conservation easement protected properties, and supports the Preserve Manager with the stewardship of the Land Trust-owned Preserves. Erik has been working in land conservation since 1999, and has been the Stewardship Director with Jefferson Land Trust since 2008. He has been an active leader in the Washington Association of Land Trusts since its founding, and was President 2013-2014. 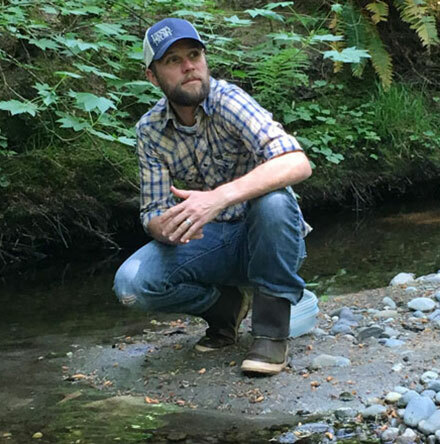 With a BA in Environmental Education, and an MA in Environmental Politics, he also created and annually operates the Land Trust’s popular Tidelands to Timberline adult natural history course, and supervises other On-The-Land-Learning community engagement programs of the Land Trust. Erik is a really great dad, pretty good naturalist, and alright musician.